Physically, mentally, and emotionally – professional cook’s and chef’s offer different levels of value as time goes by. To some, there is that uncomfortable feeling that accompanies an aging body – you know – that point in a career when you might feel a bit slower, plagued by aching muscles, and struck with the realization that certain tasks are not your strength anymore. However, those who have a vision of the future know that those tasks that seem less a part of your wheelhouse are now replaced with new skills and knowledge that are likely even more important. Youth has its advantage, but so do age and maturity. The professional cook begins with a leap into the kitchen. It will likely begin at the sink learning how to keep dishes and pots clean and at the ready. This stage is filled with intrigue and cursory observation of technicians and craftspeople that demonstrate what is possible with time and practice. Many may view this as simply a paycheck and are clear that this is NOT what they want to do with their lives, while a few are instantly attracted to the environment and the people. This, to many, is a pivotal experience that leads to some type of apprenticeship or even an interest in culinary school. Those who move through acclimation will likely find a somewhat structured transition from observer to commis. Likely, the individual in transition will begin as an assistant to a breakfast cook, or maybe an apprentice to the prep cook. The person in transition will learn how to care for, and use knives, become acclimated to the equipment at his or her disposal, start the process of ingredient identification, learn how to follow a recipe or procedure, and begin the process of multi-tasking and acclimation to speed and efficiency. Transition cooks discover the importance of and reason for processes that surround sanitation and safety. Following the introduction to process, cooks – overtime, learn not just what to do, but even more importantly – why they do it. When this occurs then a process becomes a skill, and with time they become confident with those skills. At this stage the cook becomes a true asset to the operation – his or her value is based on an understanding that each cook can be trusted and depended on to perform at a certain level while meeting the quality standards that an operation defines as essential. The movement of the cook at this point might be from prep and commis to a key position on the line – the place where cooks can become center stage players – finishers of those dishes that define the restaurant – a position of honor and pride. Repetition is as critical to a cook’s value as is the knowledge of the skill itself. Time is money and the quality of food is always dependent on the time factor. When a cook is able to meet the quality standards of the operation and perform with speed and efficiency – then others view him or her as essential to the effective operation of a restaurant. With time and effort, and with the development of speed and efficiency – comes confidence. Confident cooks allow the operation to further trust that they will be able to thrive in their position. In many cases – cooks at this level are ready for promotion that may lead to roundsman or even sous chef level roles. The most universally valuable skills are drawn from experiences (both positive and negative). The longer that a cook is working in restaurants, the more situations they are familiar with. Each time that a cook transitions through an experience – he or she adds a valuable tool to his or her essential kit. Experience, and in particular – experience in quality operations, add real value to a cooks resume. Employers place value on the experiences that will serve their operation well. There is a difference between skill and knowledge. Skill relate to the ability to complete a task with speed and efficiency as expected by those involved. Knowledge provides an opportunity for the cook to truly understand how and why the skill results in a positive outcome, and how to identify what to do when that result is not what is expected. As an example – when a cook understands why a particular ethnic cuisine includes a traditional process or ingredient then he or she is in a better position to replicate the flavor profile and experience of producing a dish. Knowledge workers are those who can move from sous chef to chef. This is a skill that is expected of that position. As a chef, the individual must be an astute manager of what is taking place today in the kitchen, but even more importantly a person who can effective plan for tomorrow, be able to think in terms of how to promote the restaurant brand, how to build a product (menu) that defines how the restaurant will be perceived, and know how to act and react when anything threatens the expectation of that brand and product. To ensure that the restaurant holds true to the defined philosophy, the expectations of the brand, and the financial performance that is required – the chef’s value comes from hiring the right staff, training and teaching those cooks in a manner that is consistent and measureable, and comfortable in the role of employee mentor and role model. The most talented cooks may not serve the operation well as a chef if they are unable to perform appropriately as a teacher/mentor. Chefs are highly competent cooks who have the ability to lead others into battle. When a chef performs contrary to the rules of competent leadership then the operation will eventually crumble from within. As a chef transitions to the twilight of his or her career, the role that he or she plays – matures. 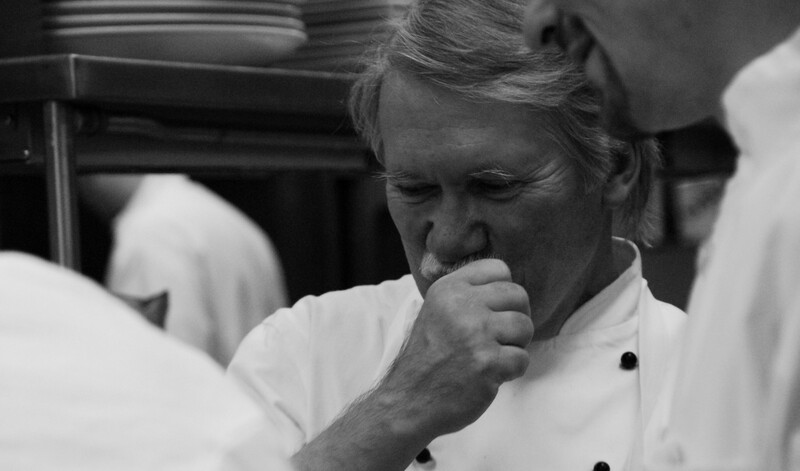 The role of the near retirement, or retired chef is that of storyteller, and protector of the traditions, standards of excellence, service attitudes, and commitment to sharing that define the senior guard. It takes many decades of work to acquire the knowledge that is required of the raconteur (storyteller). This is the time when a chef becomes a sage. Along the way, cooks acquire new skills and may find that their effectiveness at some previous skills diminish. The cook’s knowledge of why and how continues to improve, and the experiences that are part of the process continue to build confidence and competence. The value of a transitioning cook to constantly increase and should never be viewed as a process of diminishing ability, but rather the adoption of new skills and knowledge that could only result from this consistent career movement. **Photos: Thanks to Chef Joe Faria and his team at Quail Valley Country Club, and Chefs Michael Beriau & Walter Zuromski for one of those experiences. Now I feel good, as a senior chef, I’m a sage, finely.